Rumangabo, DR Congo — After almost twenty years of armed conflict in the east of the Democratic Republic of Congo, Virunga National Park today released the details of a 10-year plan to re-invigorate the local economy and create tens of thousands of new jobs as a peace-building initiative in the conflict affected areas of eastern Congo. The plan, referred to as “the Virunga Alliance” will vastly increase the availability of clean energy for rural communities through large scale investment in a network of off-grid hydro-electric plants and associated agro-industrial development. The park authorities are developing a partnership of donors and investors willing to accept high-risk investments amounting to over US$150 million. “The Virunga Alliance” promotes positive and transparent development as a means of bringing stability and prosperity to the conflict-affected communities and securing a future for one the most important wildlife areas on the planet. The Howard G Buffett Foundation, which spearheaded the initiative by providing early technical and financial support for developing the plan, has announced its further commitment of $19.7 million towards a hydro-electric power plant on the Rutshuru River. The plant is designed to have minimal ecological impact and is expected to be online in 2016, generating 12.6 megawatts of clean energy, effectively doubling the current power production for the province. The provision of electricity will boost the agricultural transformation industry from coffee, livestock, fish and support post-conflict industries such as tourism, thereby increasing rural employment and farmers’ revenue in one of the most impoverished areas on earth. The sale of electricity will also fund the park’s protection for the next 75 to 100 years, thus securing the area as a pristine World Heritage Site and home to many unique species including the endangered mountain gorillas. The plan is based on the lessons learned from a recently completed pilot project funded by the European Union and the Howard G. Buffett Foundation: a 0.4 megawatt hydro-electricity plant and two agro-industrial plants (soap and papaya enzyme) on the foothills of the 17,000 foot snow-capped Ruwenzori Mountains in the Northern Sector of the national park. Mountain Gorillas are critically endangered, with only 820 remaining in the world. Despite the conflict in the region, their decline had been reversed up until January 2007 thanks to the commitment of the local park authorities coupled with sustained international support. In 2013, there are an estimated 210 Mountain Gorillas in DR Congo. The Congolese Wildlife Authority (ICCN) and its Rangers work throughout the country to protect the National Parks of Congo and their wildlife from poachers, rebel groups, illegal mineral extraction and land invasions. Over 130 Rangers have been killed in Virunga National Park since the beginning of armed conflict in 1996. 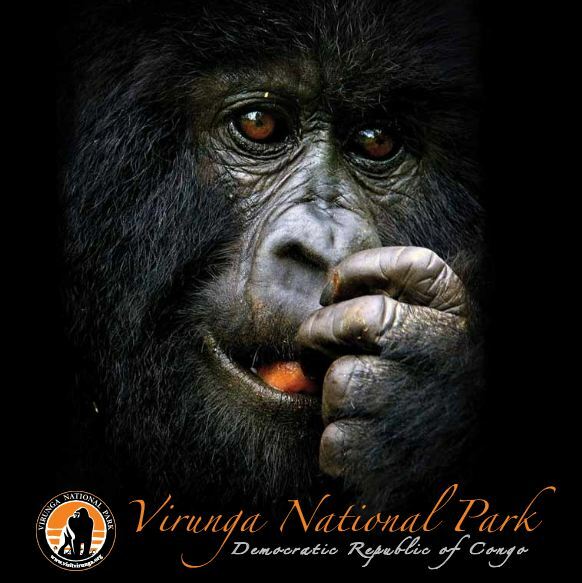 Virunga National Park, Africa’s oldest national park (established in 1925) and a UNESCO World Heritage Site since 1979, is home to 200 of the world’s mountain gorillas. Formerly known as Albert National Park, Virunga lies in eastern DR Congo and covers 7,800 square kilometers. The park is managed by the Congolese Institute for the Conservation of Nature, the Institut Congolais pour la Conservation de la Nature (ICCN).